The brontese community is composed by about 20.000 inhabitants. His economy is based on agricultural activities, the husbandry, the handicraft, the commerce, the transports and, particularly, the cultivation of pistachio, processed in Bronte and commercialized mostly abroad. The local economy is a medley of small artisans with great creative capaci­ties, of merchants and exporters of agricultural products, of pensions and salaries coming from the schools, from the hospital or from the Council, of small cattle and sheep breeding, and, above all, agriculture, that continues to occupy an important role in the economic activity. 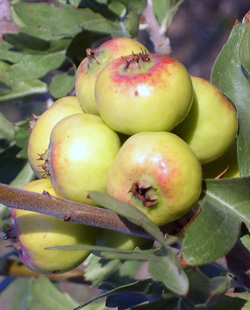 In Bronte' territory, in fact, it is possible to cultivate nearly every fruit and the brontese people, traditionally, have been mostly farmers. Are still up to date the words of Giuseppe Cimbali ("Nicola Spedalieri", Città di Castello, 1888): "Bronte is a town of antithesis and contrasts for its nature deeply varied. But, strangely enough, is a town eclectic per excellence: almost unique in Sicily, reassumes all climates and is able to produce any vegetation species. 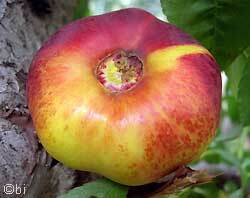 In fact, can produce what needs cold and what needs heat, and can produce also what needs a moderate temperature". 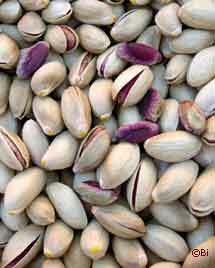 The "Tignosella" (the green gold of Bronte): the pistachio picked, peeled and dried in the sun foe two or three days. Bronte is the Italian capital of pista­chio; a wealth of over 20 millions Euro, and it represents the 1% of the world produ­ction. The grounds in the low part of the territory, along the Simeto river, are cultivated as orchards (pears, peaches, citrus fruits, etc.) and vegetables. In the rest of the land there are cultivations of olives, almonds, prickly pears (a spon­ta­neous variety of which offers a white fruit with almost no seeds), wheat and cereals of all kinds, and, further more, vines and pistachio trees. These last ones represent the most important item (the green gold of Bronte) and, strangely, they are very comfortable, just on the lava ground, that is prohibitive for any other type of cultivation ("i lochi", nearly 3.000 hectares of lava ground, with a very limited arable layers). 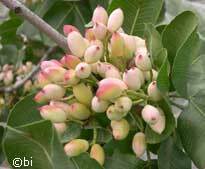 The pistachio is the principal economic resource of the territory; more than 30 thousand quintals is picked here and sold at about 5.00 Euro a kilogram, with the skin, or 12.00 euro without it. 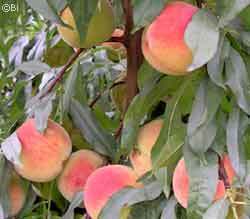 Well known for the superior quality are also the varieties of fruit, dry or green, (peaches, pears, apricots, produced along the fertile Simeto valley, almonds, walnuts), wine and olive oil. Excel also for their qualitative proprieties the cheese productions: the cottage cheese (fresh, salted or baked), and all other types of cheese. The best, for its peculiar characteristics and the ancient and genuine taste, is the sheep cheese with pepper, (also fresh or with chilly, or with pistachio or salami). 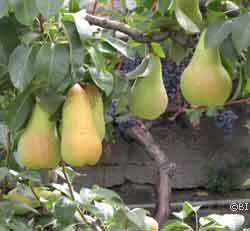 An organization of brontese fresh fruit producers "Le Valli dell’Etna", soc. cons. s.r.l. 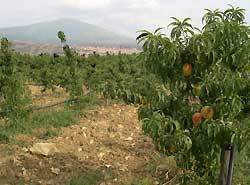 ("The Valleys of Etna", Pty Ltd), born in the last few years, with the target of concentrating and promoting the typical production of the area (above all, pears and peaches), just for the product high quality, succeeded in gaining an important role on the market of the big, national and foreign buyers. In the territory have been discovered important fields of methane, rich of liquid components (gasolina), processed in a large degasifying plant built by Eni at few kilometers from Bronte. Finds it hard to take off, however, the principal resource that the town has: the tourist initiative. This would allow to change and revitalize the territory, placed between the Etna and Nebrodi parks and the Simeto valley, the ancient lava, the centenary woods, and the historic, artistic and cultural heritage, a pole of tourist attraction. It is a lost opportunity, as the tourist potentialities of this territory and of the City of Bronte are remarkable. especially for elite tourism. The zone offers landscapes of rare beauty and suggestion, environments of relevant natura­listic and scientific interest, a town center rich of millenary history and traditions, a good arti­stic and architectonic heritage, interesting itineraries, religious and folkloristic manifesta­tions, genuine and spectacular, good cooking, clean, wholesome air and a proverbial hospitality. Today seems that something, finally, would start to move: begins to take form an old project to create, inside the Etna park, in the extremely beautiful valley of Rocca Calanna, Dies district, a tourist pole, comprising receptive and sports structures. A small hotel-restaurant, in fact, has been built already in the area. Our hope is that it shall not remain an isolated event, fortuitous and not part of a program. Ecological agriculture, farm holidays, quality control of local and typical products and the promotion (above all of pistachio and dry fruit), conservation and rehabilitation of the territory, are the key elements for the prequalification and enhancement of the brontese heritage. 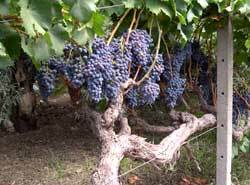 The vine cultivation has developed a lot in the past, particularly in the second half of the 18th century when, in the area of Gollia and Bolo, all the fruit trees were cut down and substituted with vineyards. This choice, unfortunately, turned out to be a disa­ster, as, few decades later, the Filossera arrival com­pletely destroyed the vineyards. In that period the Nelson Duchy establishments used to produce about 2.000 hectolitres of wine per year (and also a very good Cognac), which was exported all over Europe.